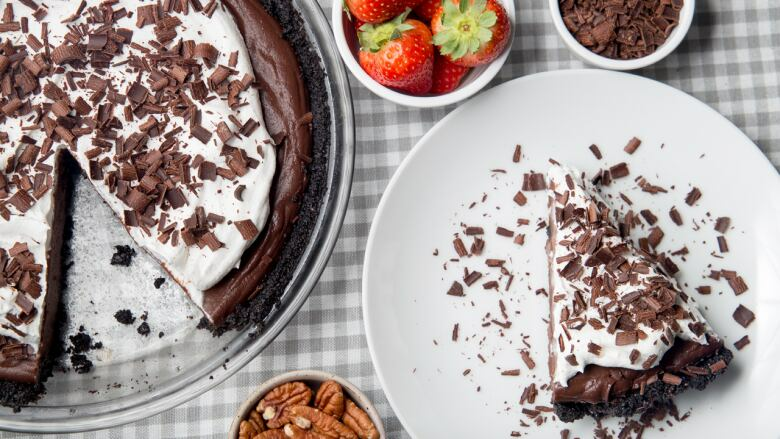 If you liked mud pie as a kid, you will love this adult version topped with a bourbon spiked whipped cream. The filling is silky smooth and the rich dark chocolate flavour is enhanced with a splash of coffee. Preheat oven to 350 degrees F. Stir together cookie crumbs, white sugar and salt. Toss in melted butter until crumb mixture is evenly coated. Scrape into 9-inch pie pan and press firmly into bottom and up sides of pan. Bake until crust is set, about 11 to 13 minutes. Cool completely on wire rack. Whisk together sugar, cocoa powder, cornstarch and salt. In another bowl, whisk egg yolks together with milk and coffee. Slowly pour wet mixture into dry, whisking constantly until smooth. Pour in chocolate mixture. Stirring constantly with heatproof spatula or wooden spoon, cook until thickens to pudding-like texture and starts to simmer and sputter, about 8 to 10 minutes. Make sure to scrape along edges and sides of pot too. Remove from heat. If there’s any lumps, strain through fine-meshed sieve. Stir in chopped chocolate, butter and vanilla extract until blended. Scrape into chocolate crust; smooth top with back of spoon. Cool at room temperature for 20 minutes. Refrigerate, uncovered, until set, about 6 to 8 hours. Whip cream with electric mixer until stiff peaks start to form. Fold in icing sugar and bourbon. Pile whipped cream on top of pie just before serving. Garnish with chocolate shavings. Serve with strawberries or pecans, if desired. For chocolate shavings, start with a bar of chocolate (about ½-inch thick) at room temperature. You can also warm the bar slightly with heat from your hands. Using a vegetable peeler, scrape across the narrow side of chocolate bar onto parchment-lined plate or tray. Store in airtight container in cool dry place. Substitute 85% dark chocolate with 70% if desired. If you like, just make the filling, divide into 6 to 8 cups. Serve with a dollop of bourbon whipped cream and chocolate shavings.